This is the third Irwell Press book written by Mike G. Fell OBE concerning ports and their railways. The previous two have covered Kings Lynn and Goole. Mike, a Fellow of the Chartered Institute of Logistics and Transport, was in charge of the Port of Hull for sixteen years from 1987 until 2003 and previously was a stevedoring operations manager at the port for three years from 1977 to 1979. The book describes and graphically illustrates the history of the port and its railways from the time of the opening of Queens Dock in 1778 until the present day. One of the books chief aims is to dispel the widespread notion that Hull was only a fishing port. The fishing industry was once very important to the City of Hull but it actually formed only a small part of the ports overall commercial activities. Hulls success was founded on its ability to offer excellent facilities to increasingly larger ships which traded worldwide with a great variety of cargoes and the export of coal from the South Yorkshire coalfield, all of which arrived by train. Irwell Press first published Great British Railway Station Kings Cross in 1990, before the biggest urban renewal project in Western Europe got under way and The Cross metamorphosed into the restored and enhanced modern wonder of today. The seediness, the littered grimy streets and Norf London working class air has utterly vanished which is in a way a shame but the old place has gained, well, take a look round Cubitts stolid building, once mirrored but now conjoined by the Gothic pile across the road and judge for yourself what it might have gained. That biggest urban renewal project in Western Europe back in 1990 many saw it as a dire threat, with proposals to demolish the Great Northern Hotel and other outlandish mortifications but in the end it has all gone rather well and the stations, Kings Cross and St Pancras are happily safe as long as there is a London - remember, for many years both lived under the threat of annihilation. Their fate could so easily have been that of Euston, just up the road. ROYALTIES TO THE SOBRIETY PROJECT. This work follows a similar style to that adopted for the authors previous book An Illustrated History of THE PORT OF KINGS LYNN AND ITS RAILWAYS published by Irwell Press in 2012. As such it is not intended to be a definitive history of the Port of Goole but, like its predecessor, an informative and graphic portrayal of the port from its inception to the present day including its railway connections, past and present. The author enjoyed the privilege of being responsible for both ports. Insofar as Goole is concerned, he was Assistant Docks Manager there from March 1983 until June 1984 and had overall responsibility for the port, along with the much larger Port of Hull, from 1998 until his retirement on 31 March 2003. The following year, he was appointed as non-executive chairman of RMS Europe Group Limited, a stevedoring company operating the Boothferry Terminal in Goole and the owner of two wharves on the River Trent at Flixborough and Gunness. he held that position until July 2007 when, following a successful management buyout, he finally said goodbye to the port transport industry as a means of employment after a career spanning 37 years. However, its fascination remains undiminished especially as its importance, rather amazingly, remains largely unrecognized notwithstanding the fact that some 95% of UK trade is handled through seaports. This amounts to an astonishing total of 560 million tonnes of cargo annually all of which arrives and departs from the ports around our coastline. The ports on the Rivers Humber, Ouse and Trent play an increasingly major part in the UK economy, greater than any other group of ports around a single estuary. The Port of Goole, some 50 miles from the open sea, continues to have an important role to play. An unusual book  Much of it ... written by other people as author Peter Townend puts it. After the success of Top Shed (Ian Allan, 1975 and 1989) he completed a further work entitled East Coast Pacifics at Work (Ian Allan, 1982). The publishers requested that various chapters might be contributed by other people writing about their own involvement and experiences with these locomotives, but this resulted in a book much larger than anticipated and the contributions were not included. Now, with the passage of over thirty years the material has gained in historical interest and is seen here for the first time. The contributors, men of the time and all providing unique insights into the Pacifics, their construction and their working, read like a roll-call of the Gresley East Coast Age; many well known, others not so. Not the Three Tenors, but the Three Accompaniments. The Book of the A4 Pacifics is undergoing yet another reprint and as these things do the three A4 Photographic Accompaniments (published 2006) after a long run, contrived to go out of print, a happy/unhappy event spurred on by the interest from the Great Gathering of the A4s at York this year. 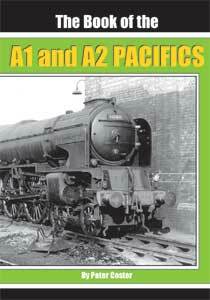 The Book of the A4 Pacifics Accompaniments Compendium, 176 pages at a cost-busting £19.95. Opportunity has been taken to incorporate some minor corrections and additions along with some new photographs. In April 2012 it was 90 years since home-going passengers at Kings Cross were astonished at the presence of a huge, handsome express steam locomotive standing on the empty stock roads, the like of which they had never seen before. It was GREAT NORTHERN, awaiting inspection by the GNR Directors. This year will be the 90th year since the third of these locomotives emerged from Doncaster Works  The Plant  1472, later 4472, soon to be named FLYING SCOTSMAN. These three anniversaries we hope to commemorate with this New Book of the A3s. The story of the class was set out in the original Book Of the A3s by the same author; he has now put down the history of each individual locomotive, summarising events, together with personal comments. Even now, while the history of the class is generally complete, there is a trickle of new information on the details of individual locomotives, revealing more about their use and particularly during the sad business of withdrawal and disposal. The geology of Leicestershire is dominated by the igneous rocks which form the beautiful Charnwood Forest, immediately to the west of Leicester city. The eastern boundary is formed by the river Soar and its navigation on a north-south line. Running in this river valley is the former Midland Railway four track main line to Derby and Nottingham. To the east are the Lower Lias beds which reach a depth of over nine hundred feet and have been actively worked for over a hundred years. This activity is now conducted underground and the modern works, producing plaster products, are at Barrow-on-Soar, opposite the railway sidings of the Lafarge granite stone loading terminal. To the west, at Coalville, coal has been extracted in and around the appropriately named town. The renowned Snibston Mine is now a museum under the management of the Leicestershire Museum Service. Other collieries were at Whitwick, where there was also a granite quarry, and a few miles south there were Ellistown, Ibstock, Desford, Nailstone and Measham Collieries; further west was the well known Moira Colliery near Burton-on-Trent. The east-west extent of the granite area is eight miles and north-south it extends for some sixteen miles. At the northern extremity was the Shepshed quarry while the southern-most quarrying took place at Stoney Stanton and Narborough, bounded by the old South Leicester line of the LNWR. All the coal collieries and the granite quarries of any size were once served by railways; many of the quarries had their own railway networks, complete with a wonderful range of locomotives and private owner wagons, employing several different gauges. Today the largest granite quarry in Europe, Mountsorrel, lies on the north-eastern boundary; it still has a considerable private railway system in the ownership of the giant French aggregates business Lafarge Aggregates. On the western and southern areas, another firm, Aggregates Industries, have smaller railways, at Bardon Hill and Croft Quarries. Close to the coal measures is Stud Farm rail ballast loading plant; formerly owned by Tarmac Ltd, a narrow gauge railway connected it to the quarry at Markfield. With the second book of the pair examining the engineering and operation of the GNR main line from Kings Cross to Doncaster over the years, we turn our attention away from the metropolis towards the countryside. I have not repeated the preface of Part One, but the comments apply equally to Part Two. This is not a detailed history of the GN main line, but an engineering and operational commentary. However, it would not be possible nowadays to write a reflective account of this nature without acknowledging the enormous archive of historical material from the many authors who have already written on this subject and I am happy to do so. As I wrote in Part One, the definitive work was that of Charles H Grinling, "The History of the Great Northern Railway". Then there was the work of such as John Wrottesley, R A H (Bob) Weight, F A S Brown, E A J Neve, W A Tuplin and others, latterly Dr Ben Brooksbank. To all these I give my grateful thanks. While my knowledge of the GN main line is good, it is not infallible, and where there is doubt over any issue or caption, I have said so. Anecdotes were part of the working railway at all levels and I have included a selection where it seemed apposite, as I recall them together with my own memories. Comments and clarification should be forwarded to Irwell Press in the usual way. My grateful thanks go to friends and colleagues over the years, particularly Ken Haysom, formerly Assistant Chief Civil Engineer on the Southern Region of BR and previously Divisional Engineer at Kings Cross. This has been assembled for your interest, nostalgia and perhaps even amusement. This is my tribute to generations of "GN men and women" who built and ran a good railway that I remember with admiration and fondness. The sum of all the books ever published on the Great Northern Railway from Kings Cross to Doncaster, its successors the LNER, then the Eastern Region of British Railways, and now including Railtrack and Network Rail, together with the engineers and their locomotives, if laid end to end, would take us well down the line itself, maybe even beyond it. And that's without the outpourings of the Internet. This is different; a book about the GNR, of course, but from the engineering and operational perspective in particular, continuing from the last days of the GNR up to the present time. It is a description of the heritage that our predecessors created, their skill, experience and occasional mistakes, judged intelligently (it is to be hoped) with hindsight. The two volumes describe the GNR main line in the form of a journey northwards to the centre of the universe for aficionados, Doncaster; Part One takes us as far as Welwyn Garden City. Inevitably, for one whose acquaintance with the 'GN', as we called it, started a quarter of a century after the company's demise, it is seen through the prisms of engineering knowledge and personal experience. It is illustrated with Ordnance Surveys of the period in most cases, although some post-date the 1922 Grouping, complemented with photographs. It describes what would now be termed the 'infrastructure' of the GNR existing at the time of Grouping, describing the methods of construction used, the implications for subsequent maintenance and renewals and the methods used, over the decades up to the present. The commentary continues with subsequent events on the working railway up to more recent times, particularly methods on maintaining the working railway, with anecdotes from that working railway. 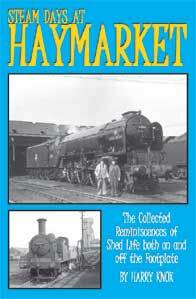 In this book dealing with the principal steam express locomotives of the LNER and its nationalised successor, we consider the Pacifics that followed those of Sir Nigel Gresley, finishing with the last, and perhaps by post-war railway operational standards, the most successful steam design, the A1 Pacific of Arthur Peppercorn. The A1 was introduced not merely in the eleventh hour of the old Big Four, but almost in the last five minutes of that hour. In the mêlée of nationalisation, the new Railway Executives mechanical engineering team, determined to create a new railway with the new standard locomotives, turned its back on the most successful large passenger designs. These were Gresleys A4 and Sir Williams magnificent Duchess Pacific, joined by Peppercorns A1. The sequence of events that led to the A1 actually started with Gresleys Mikado of 1934, and it was the need to resolve the problems of these magnificent but flawed locomotives that led to the emergence firstly of the Pacifics of Edward Thompson, then secondly those of Arthur Peppercorn. With the relatively abrupt abandonment of steam in favour of diesel and electric traction, the working life of all post-war designs was truncated, and the engines working life became shorter with the later designs. The story of the development of steam traction on the East Coast Route must be one of the best known and documented stories in steam locomotive history, if not the best. The rapid enlargement of steam locomotives under the leadership of Henry Ivatt was followed by the long tenure of Nigel Gresley, culminating in his magnificent Pacifics, Green Arrows and Mikados, and 126mph. In this book Peter Coster touches on the salient features of the story as they concern Gresleys first Pacifics of Class A1 moving on to his Class A3. The narrative and illustrations deal with the long history of these splendid locomotives, to which the author makes his own comments as they seem appropriate. For many of us, these locomotives had a special place in our affections. Nigel Gresley built his Pacifics not just to look magnificent, but to work hard and efficiently. We start with his A1 Pacific No.1470, which was introduced in 1922, and move on to the A3, introduced in 1928. The work of these locomotives will be described and illustrated, up to the very last in service under British Railways. The author has used the appropriate locomotive numbers for the period, and names, but has used 24hr notation for times of day. He has also used the LNER classification rather than the GNR, to which it was very similar in principle, but different in detail. Peter Coster has written this short account of one of the most famous and well-loved steam locomotive designs as both a railway engineer and as a lifelong enthusiast. Although he has done many things in his professional career and in his leisure, he has not been fortunate enough to work with locomotives such as these. However, it was his good fortune to know as friends many who did, and has drawn much from what he learnt from them in this book. This account is written by an author who lived, as many did, at the south end of the East Coast main line, and therefore it is seen in that perspective. Although he has tried to cover events and situations overall, the stories and anecdotes lean towards the southern end of the line. Life in the days of BR steam at one of the most renowned locomotive depots in Scotland, the celebrated Haymarket, 64B. A well-written worm's eye view from a Cleaner/Office Boy/Fireman who before he moved on to (much) higher things on the railway experienced every facet of locomotive life at Haymarket. This meant work in and around the Scottish capital and out to Glasgow, Aberdeen, Newcastle and the Waverley route. Star studded cast of LNER Pacifics, from SPEARMINT and MERLIN to AULD REEKIE, BONNIE DUNDEE and all the rest. Breathtaking collection of unseen photographs.